Enjoy the freedom of cooking breakfast, lunch, and dinner in your condo. Kick back on the couch after a fun day on the beach. The indoor pool area is a great place to swim on rainy days. The resort's lazy river is stocked with complimentary inner tubes. Horizon at 77th is just one block from the beach and less than twenty minutes from Myrtle Beach’s best attractions. After getting settled into your condo, change into swimsuits, grab pool toys and water wings and slather everyone with SPF before heading to the outdoor pool. Lounge poolside with the latest issue of People magazine, relax in the hot tub or float along the lazy river. Little ones will love the children’s pool. Weather not cooperating? No problem! Horizon at 77th has an indoor pool. When it’s time for lunch, head to sister resort Grande Shores and grab a bite to eat at Shoreline Cafe. Feel like a workout? The resort has a modern fitness facility, perfect for getting your cardio on. One- to three-bedroom condos sleep two to ten guests and have enough space for the kids along with their toys, stuffed animals, pillow pets. A family field trip to the Piggly Wiggly Grocery Store is definitely in order – your full kitchen won’t stock itself. Recruit the kids to help bake your famous chocolate chip cookies (not that they’ll need convincing). Don't worry if the eggs and flour decide to go rogue, that's what the in-suite washer/dryer is for. Up for a low-key night in? TVs with Cable and DVD players have you covered. Catch a sitcom rerun or bring favorite movies from home, pop some popcorn and call everyone into the living room for family movie night. Take advantage of Horizon at 77th’s proximity to the beach. Work on your sun kissed look while the kids look for seashells or build the ultimate sand castle. Broadway at the Beach is a ten-minute drive from the resort and features a variety of shopping and dining. Treat yourself to a new pair of sunglasses at Sunglass Hut. There are three locations! Surprise the kids with a visit to Build-a-Bear for a unique souvenir and let them pick out a present for your four-legged family member at Reigning Cats & Dogs. Hungry? Johnny Rockets, Hard Rock Cafe and Dave & Busters are just some of your options. See the 750,000-gallon shark tank at Ripley’s Aquarium or an authentic shrunken head at Ripley’s Odditorium. 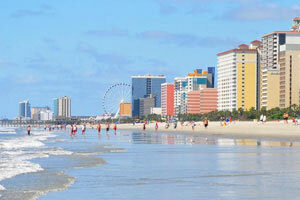 Enjoy the best views of Myrtle Beach with a ride on the SkyWheel. The gondolas are climate-controlled to ensure that everyone can ride in comfort. Up for more shopping? Great! Gather the kids and head to Barefoot Landing. Satisfy your sweet tooth with a visit to Candy Mike’s. Del Sol features apparel, jewelry, and accessories that change colors when exposed to sunlight. Barefoot General Store is where you'll find Myrtle Beach-themed merchandise. - Front desk is located at a different location: Grande Shores Resort, located at 201 77th Ave North, Myrtle Beach, 29572.